When two sided access is what you’re looking for, Rivet Shelving may be just the answer. Derived from the look of it’s beam fasteners, these rivet like pins provide a number of benefits to the shelving unit. Stacking one on top of another, they nest in a tear drop shaped post hole, therefore, providing a secure dual connection to the shelf post. 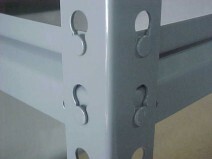 As weight is added to the shelf, this connection becomes that much more solid.Secondly, due to the fact that there are two of these pins stacked vertically one on topof another, they provide the lateral stability to the unit therefore eliminating the needfor cross braces. With a wide selection of beams, posts and reinforcement bars to meet virtually anycapacity requirement and with shelving decks ranging from particle board, metal pan,to wire mesh decks, rivet shelving is truly a main staple to the shelving industry. Question? We offer free consultation and are here to help! Contact us, or request a quote.